Today, we had an ultra-scan at the hospital. 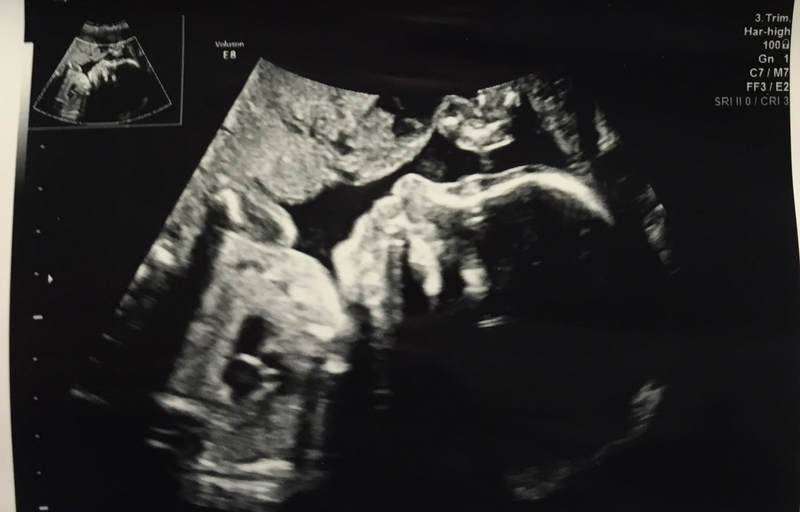 This was our 3rd scan over the last five weeks, and I’m happy to report back with some news. At the 1-hour anatomy scan that is typically done around Week 20, they found a small issue with the baby’s kidneys. They were too big “or maybe, dilated?”, was what we were told by the sonographer in broken English. At first she thought it was just the left kidney, but it turned out to be both left and right. She told me, as I wiped the gooey ultrasound-gel off of my belly, that she found two markers for down syndrome. A kidney issue and now, a “bright bowel.” She went on to explain that I could request a CVS or amniocentesis, if I wanted confirmation, to which I interjected that I did not want that, and that I had done a NIPT test (the Harmony Test) back in California during Week 10, and that my results showed a low risk  for trisomies of the 13th, 18th or 21st chromosomes (down syndrome). She gave what sounded like a small sigh of relief and said, “Terrific. Definitely no amnio for you, given how much you’ve fought to get here! No need to risk anything.” I couldn’t have agreed more. She explained that little bub’s kidneys were dilated, showing signs of inflammation and some sort of obstruction in the ureters coming out of the kidneys. They measured much thicker than they should typically measure, which is a sign of inflammation and/or a blockage (I’m paraphrasing). The bright bowel was a soft marker for Cystic Fibrosis. She said they wanted to scan me again in another 3 weeks to check on the baby’s kidneys and bowel. I left the Obstetrics ward of the hospital, ambled to the main lobby and dialled Martin. He was out of breath, and approximately half-way down a mountain on his snowboard. I told him all the details and measurements that I could remember. And I downplayed my worries, “These things happen. I’m not worried.” (Big lie). Yada yada. I biked home and proceeded to call my dear friend, Tanya, who I decided, I was safe enough to cry to. My anxious tears spilled out, and all I could really get out was that I was deeply afraid my sweet boy might have medical issues when he’s born. He might have kidneys that aren’t right. He might suffer. He might have frequent UTIs. Or much worse. And while these issues seemed fairly treatable, surgical or fixable, I just couldn’t bear the thought of him getting a body and a host of organs that were anything less than perfect. My poor, poor baby. Tanya was brilliant and calmed me down. I realized in that moment that the mommy-worries can start eve before the Parent-title is even officially given. I had to trust that my baby would be okay, and that the good doctors who have been treating me would be able to handle just about anything. Throughout this pregnancy, I’ve been immeasurably grateful for the terrific team of professionals who have been monitoring the little guy and me. The staff at the hospital have been so attentive, thorough and kind. So today, three weeks since that last appointment, feeling guarded but prepared, we returned for a scan during this 25th Week and were met with much better news. Little baby’s right kidney was measuring perfect, the ureters were clear and fluid was passing through (showing no obstruction); the bowel was not bright, and the only minor issue left was a little dilation in his left kidney. We will be scanned at Week 32 to see how it’s faring, but the sonographer says she expects it to be down to a normal level by then. I think Martin, my sweet, shy husband, could have jumped up and hugged her. We feel amazing right now. And so darn lucky to have seen this improvement since our last scan. Our little lovebug was active and squirming, and it was a joy to see him on the screen again, as it always is. We are so grateful for your love and support – thank you for sticking with us through this pregnancy! And now, here is the latest profile snapshot of the Little Prince, taken just today. Hi Cammy! Still hoping and praying everything is okay and would love and update from you! Sending so much love!!! Hi Cammy, you stopped blogging;( I hope everything is ok and you are just too busy to write. Hugs.